FORESTRY is becoming more and more an international affair. Registration for the Sixth World Forestry Congress in June of this year topped 2,000 members and some 700 associate members from 93 countries. The discussions at Madrid were wide ranging and there were items of interest for all parts of the world. The role of forestry in the changing world economy was the central theme of the Congress and the background was the study Wood: world trends and prospects published in a special issue of Unasylva. FAO issued two other supporting publications: World forest products statistics - a ten-year summary 1951-1963 and World forest inventory 1963. The concern of Congress members was focused on meeting the growing world demand for wood raw material, on the amount of wood available and its utilization. No world wood shortage is likely, but local shortages may induce changes in some patterns of international trade and in the distribution of wood. Many undeveloped countries feel that acceleration of capital investment and active industrial participation of established industries in similar activities in the developing world are vital elements for their increased economic activity and employment opportunities. But large-scale forest industries are ventures that must be carefully planned, and which require considerable amounts of capital and highly competent managerial and technical staff. The Congress urged governments receiving aid from outside sources to create by their own efforts and endeavors such conditions as will enable them best to profit from the technical and material assistance afforded to them. The Congress hoped these kinds of assistance could then be still further expanded. This is not a matter where foresters by themselves have great political influence. 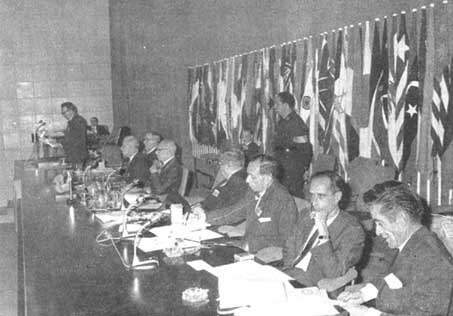 For this reason the Congress endorsed a formal resolution asking the next host country, when extending invitations for the Seventh Congress expected to be held in 1972, to urge governments to include in their delegations members of legislative and executive bodies. Many ministers and members of legislatures already present this time in Spain agreed that it was a salutary experience to become acquainted at first hand with forestry specialists and technical forestry problems. Offers to act as host to the Seventh World Forestry Congress were extended by representatives of Argentina, Chile and the U.S.S.R. A decision as to the exact time and place will be taken in due course by the FAO Conference, the governing body of the Organization. The Congress warmly thanked the authorities of the Spanish Government and of the city of Madrid for having prepared and staged the Congress. The forest administrations of France, Morocco and Portugal were also formally thanked for the study-tour arrangements made in those countries. Finally, at their closing meeting the Congress members gave a standing ovation to the Congress President, F. Ortuño Medina, Director-General of the Spanish Forest Service. Although some members of the Congress welcomed the apparent trends in world forestry with something less than wild enthusiasm, most were in accord with the seeming shift of emphasis from resource conservation to resource planning and management. For the developing world, and that means mostly the tropics, the need is -for planners to reveal by how much forest production must be increased, where and how it can best be expanded, and how much it will cost to produce the desired result. The basic working level must be the individual country. The pulp and paper industry will be of increasing importance to forestry; forestry education and institutional patterns must be adapted to the needs of today and tomorrow; recreation and wildlife management in forest areas will increasingly become routine features of the foresters work. It remains now to decide how FAO's work and programs can best be adjusted to these findings. FIGURE 1. - The Director-General of FAO Dr. B.R. 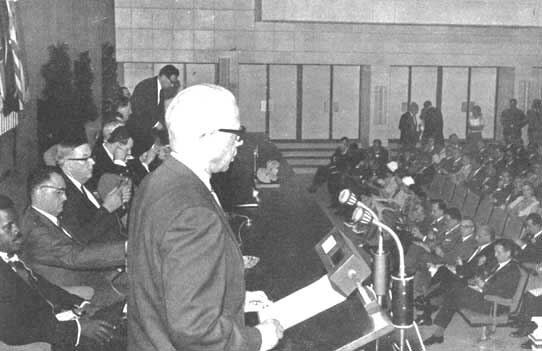 Sen, addressing members of the Congress at the opening ceremony. I MUST first thank you for the Resolution through which you have formally expressed your appreciation for all that has been done by the Government of Spain and by the city of Madrid in organizing this Congress. You may be certain that your appreciation is ample compensation for our efforts. Mr. Velay, Chairman of the Resolutions Committee, has rightly said that it is in fact up to each one of us to draw his own conclusions from the work done at this Congress. It is my privilege, as President, to be the first to perform this difficult task, which to me seems the best and most proper subject for these closing words. I shall therefore give you my own views of the results of our deliberations, views that are necessarily incomplete and hasty but which I put before you objectively, in an effort to call to mind what seems to me the most outstanding among the points that have received general approbation during our plenary and technical sessions. In my opening address I referred to the central theme of this Congress: "The role of forestry in the changing world economy." This theme has proved to be most apposite because the world of today has constantly been the background for our deliberations: a world undergoing a population expansion and economic growth, witnessing scientific and technological advances but, at the same time, a world made up of rich and poor nations, of nations sometimes separated by political or economic barriers, yet alike in their collective aspiration for peace and prosperity. In my opinion, the FAO study and the discussions here on world timber trends and outlook have come up to the highest expectations. I want to congratulate the Forestry and Forest Products Division of FAO through its Director, who is here in person, for the service rendered by FAO to the cause of world forestry through this publication, and I am confident I echo the general feeling of this gathering. This survey, however, is not only the culmination of a long and ambitious undertaking: it is above all a point of departure. Important as is the information it provides, still more important are the new horizons it opens up before us, the questions it puts to us, the stimulus it gives us. Henceforth, forest policy makers and planners will have a basis of reference worldwide in scale to serve and aid them in their thinking and decisions. I am convinced that all of us wish this study developed at regular intervals and kept up to date. A basic consequence of this Congress, it seems clear to me, is the confirmation of the increasing international implications of forestry development. The trade in forest products is evidence of this because we are constantly acquiring greater knowledge of the quantity, nature and location of the world's forestry resources and we know the how, where and when of forest product requirements. The work of this Congress has revealed to us that, while this knowledge is indispensable, it is not enough by itself to constitute an automatic stimulus to the world timber trade. As Dr. Hernán Santa Cruz has told us, we must expand the areas of free trade and facilitate international trade. But, above all, we must produce cheaper timber. We are grateful for the attention paid by the Technical Commissions to this question in all its aspects, from planting to manufacture, through protection and: management to extraction and transport, since the problem of cost is a decisive factor in each phase of forest production and processing. The plenary sessions have singled out those institutional requirements that may serve to widen the margin between cost and profit in wood production and to make the forestry enterprise economically viable. While seeking solutions to the problem of costs, we also approach the problem of financing, since capital for economically sound enterprises must not be found wanting. The discussions on the question of financing have brought out a key point in my opinion: we must make serious efforts to set out our arguments convincingly in order to attract investments to the forestry sector. A necessary condition for achieving this aim is a more thorough study of the relationships between costs and profits in the forestry enterprise; it offers the only means whereby we shall be able to speak to financiers and economists in their own language. This is of great importance in all countries but especially so in the developing countries, which often have the soils and climate necessary to produce timber at competitive prices but leek the capital required to develop their forests or to establish forest plantations and industries. I believe that industrialized countries will not lose sight of these opportunities and that in future we shall see a much greater flow of capital for investment in forestry across national borders. This will; be facilitated if countries short of capital can attract it by offering adequate security and incentives for investors, without prejudice to their own national interests. However, the increasingly international nature of forestry is not confined to money and products but - first of all, I would say - is a matter of men and ideas. Your discussions on research and on forestry education have shown that schools and research centers working in isolation are a thing of the past. The exchange of knowledge and personnel in the forestry sector must be expanded, and I am sure that this will redound to the benefit not only of countries where trained personnel and funds are less plentiful, but also of the more advanced nations, since the dissemination of scientific and technological achievements, together with human contacts, will contribute to a better worldwide balance. This foreseeable increase in the international impact of forestry gives timeliness to your Resolution calling on FAO to reinforce the activities of its Forestry and Forest Products Division, which for years has been the main forestry agency with a worldwide charter. Turning to the prospects within national boundaries, I feel that the broader international vision we now possess, together with the rapid social and economic changes we are witnessing, will not fail to permeate forest policies and institutions in our own countries. For instance, forestry development planning, which has been so wisely treated at this Congress, will gain momentum as we gain a better knowledge of the potential resources and requirements of other countries. We are now convinced that our task is not so much one of preserving renewable sources but rather of developing them and improving their management. This presupposes a careful distribution and scaling of investments, the harmonization of the various direct and indirect uses of forestry, and a better integration of forest industries with their forestry foundation, which can only be achieved through more precise and methodical planning than is involved in mere forest policy. But it is pointless to plan for the forestry sector in an isolated manner; forestry experts must therefore pass beyond their traditional frontiers and take a more active part in drawing up national development plans. Implicit in this objective is the granting to Forestry Administrations of a sufficiently high position within the administrative hierarchy and recognition of the great contribution to planning that may be expected of foresters by reason of their experience in the long-term management of extensive areas and essential resources. In order that the forester may successfully perform these tasks, I believe it is also necessary to transcend the limits of classical forestry science. It is necessary to strengthen the teaching of economics and planning methodology without, however, losing sight of the traditional wellsprings of our own forestry training and background, since it is up to us to synthesize the various specialized fields. We should take the new instruments offered by other disciplines and adapt them to the requirements of our work, but we should also defend what is essentially forestry, as well as our right to decide on matters concerning the biological entity formed by the forest. I should now like to touch upon your deliberations on the matter of the indirect benefits to be derived from forestry. We must persevere in our efforts to identify and quantify the benefits offered by the forestry sector in terms of soil protection, water management, preservation of fauna and recreation. Only thus shall we be able to mold public opinion and convince governments that money must be spent to keep up and enhance these functions of the forestry sector, and arrive at an equitable decision as to who pays the bill. This Congress has shown us that we must not be satisfied with doing our forestry job properly: we must keep the public better informed as to what we do and why we do it. In many countries, moreover, we need to give greater stimulus to private forestry initiative by promoting associations and co-operatives, and by seeing to it that a forest owner has a guarantee of continuity and technical help indispensable for making long-term plans for development. I know I have not succeeded in summarizing all the conclusions that could be drawn from your discussions and in particular from the meetings of the ten Technical Commissions. To do so adequately would require much time, so much so that I wonder whether it would not be of advantage for future congresses to find a formula for restricting the variety and complexity of subjects to be dealt with. Nonetheless, the Congress we are bringing to a close today impresses me as having been extremely fruitful, and this is due to the great contributions all of you have made. Once again I wish to express my appreciation for your efforts and in particular for the very efficient work done by FAO which has helped so much in planning and carrying out the business of this Congress. I am certain some of you have found faults and defects, but I am equally certain that you will have understood that they have come about solely because of the limitations of our capacity and means. Thus I am confident, as I wish you a happy return to your homes, that you will carry with you a pleasant memory of this Congress. For my part, I shall treasure the best of memories, because at this Congress we have not merely aired questions relating to our scientific, technical or professional concerns but we have discussed very amply in the course of our debates perhaps more than ever before - matters such as population, social welfare, employment, security, needs; in a word, Man. And that is as it should be because we have come together here not only as professionals, administrators, scientists, owners or industrialists to examine the problems we have in common. We have come together, above all, as men of goodwill endeavoring to place our collective efforts at the service of mankind. ¹ These are not final authoritative texts. Publication of the Proceedings of the congress is of course the privilege of the Spanish Organizing committee. 1. The Sixth World Forestry Congress welcomed the study submitted by FAO entitled Wood: World trends and prospects as the first integrated global appraisal of major trends in the world forest and forest products economy. 2. Members stressed the extreme importance of such appraisals for a proper understanding of the intimate relationship between economic growth, wood needs and wood supplies. These analyses serve to illuminate the problems and prospects against which policy decisions must be taken; and to provide the quantitative background for sound forward planning that is so essential, given the relatively long wood production cycle. With the world economy in rapid change, there is continuing need for analyses of this type at both regional and world levels. 3. The Congress recommended, therefore, to governments and to FAO that analysis of trends in the forest economy be initiated, continued or intensified with systematically improved basic information, with increasing attention to the cost/return aspects of forest products supply and with recognition of the usefulness of long- as well as medium-term projections of future trends. 4. The unprecedented changes taking place in the world economy are being accompanied by equally profound developments in the wood and wood-using sectors. The world's population and economic wealth are both growing at rates which have never before been achieved over any sustained period. But the widely disparate rates at which they are growing in different parts of the world is bringing about major shifts in the geographical distribution of population and wealth. 5. The rising demand for wood and wood products is a concomitant of this expansion. It also reflects the geographical concentration of income and is thus heavily concentrated in the industrially developed countries. These advanced countries, which contain less than a third of the world's population, will account for 70 percent of the extra industrial wood needed by 1975. 6. In some of the developed regions, this upsurge in demand since midcentury (in sharp contrast with the relative stability in demand during the first half of the century) is already imposing strains on the supply sector. 7. The growth in demand is accompanied by a rapid change in the pattern of demand. Wood is increasingly being used in processed rather than round form, and it is the more highly processed forms - paper, paperboard, and panels - for which demand is most dynamic. Thus the mixture of sizes, qualities and species of wood required from the forest is also changing rapidly. This has profound implications for forest policy and management. 8. The Congress emphasized that, though its discussions were based upon forward estimates of what was likely to develop by 1975, the trends disclosed in this relatively short period would continue through the last quarter of the century. Thus the problems stemming from the continuing expansion and changing pattern of demand will intensify in the subsequent decades. 9. The Congress affirmed that there is not now, and need not be in the future, any overall world shortage of wood. Additional supplies can be obtained by extending forest operations into yet unused areas; there are tremendous opportunities for raising productivity in areas presently in use and for establishing new plantation forests, and much more effective use can be made of wood now harvested. However, a certain concern was expressed with respect to this mobilization of forest resources because of existing and possible developments in the relationship between production costs and market returns for forest products, and it was stressed that the production factors need to be kept under close review. Investigation of the economic base of expenditure in forest work and of the ways and means of reducing this expenditure, and also scientific investigation of the process of price formation in forest production, need more attention than they are now given. 10. At the growing and harvesting stages of the wood production process, technology has barely begun to make its contribution. The coming years can be expected to produce a technical revolution in these stages comparable to that which has already taken place in agriculture in the advanced countries. These developments are being facilitated by technological progress in the processing stages which permits a more integral utilization of the forest crop. Thus technology is enabling wood to be grown and harvested more quickly and more cheaply; it is also raising the efficiency in use of each cubic meter harvested. While in some end uses the technological substitution of wood by other materials will certainly continue, this is likely to be more than offset by the steady development of new applications and new markets for wood. 11. However, even with maximum efforts to raise productivity and improve utilization, wood deficits in certain areas of the world will grow and new deficits will arise. 12. A growing proportion of the world's wood needs will be satisfied through trade, in particular in western Europe and Japan. Most of the new or enlarged trade flows will be in products - pulp, paper and sawn softwood - most readily supplied by the established producers in the conifer-rich forest lands of the north temperate zone. Certain developing countries favored by soil and climate for the cheap production of coniferous timber may well share in this expanding trade. 13. There will also be a need for a much larger flow of hardwoods of the sort found predominantly in the tropical rain forests. But the countries endowed with such forests will encounter difficulties in meeting this demand. Apart from the problems associated with their early stage of development, existing tariff structures in, and trade links with, the principal importing countries discourage the needed expansion and upgrading of trade. 14. Over most of the developing world, the adverse trade in forest products reflects not wood deficits but inadequate domestic processing facilities. Considerable investments in both forest development and forest industry plants will be needed if the rapidly rising wood needs are to be met. In addition to the monetary investment necessary, this mobilization of resources will require the application of knowledge and skills made available through increased training and technical assistance. It will also require a concerted and integrated effort by both public and private sectors and by the producers and industrial users of wood; in particular, to ensure the proper relationship between forests and agriculture and to ensure the proper balance between development of wood production and the development of wood-using industries. 15. The Congress recommended that the industrially more advanced countries, in recognition of the role accelerated development of the forest and forest industry sector of the developing countries could play both in the economic development of these countries, and in supplying a growing part of the needs of the rest of the world, should intensify the transfer of the necessary skills, technology and capital to the developing countries. The Congress drew the attention of industrialized countries to the interest for the developing countries of reducing as rapidly as possible the tariffs and other restrictions which hinder the export of wood products from the developing countries to the developed. 16. Moreover, FAO, the United Nations Development Program, the International Bank for Reconstruction and Development, and the other international agencies concerned, should intensify and expand their programs of technical and financial assistance directed at the development of the forest and forest industries sectors in the developing countries. 17. Governments should recognize the unusually important role that the forests and forest industries, if properly developed, can play in promoting agricultural, industrial, social and economic progress, and should ensure that the resources necessary to bring about this development be devoted to the wood sector. The Congress called attention to the fact that national development plans for the forestry sectors should take into account international market conditions and that governments should also regularly review their own policies against the background of the regional and worldwide studies undertaken by international organizations. In particular, account should be taken of the extent to which national needs can best be met by overseas supplies and the extent to which national resources can contribute to satisfying world needs elsewhere. 18. To this effect, the Congress pointed to the desirability of periodic confrontation at the regional and world level of national plans for the development of the forestry sector. Only by concerting national plans at a regional and world level can optimum use of the forest resource in the interest of all people be ensured. 19. In discussing "Planning the use of forest potentials," the Congress reviewed, first, the future of management planning of the forest enterprise itself, including forest industrial development, and then the integration of forestry plans with regional and national planning. In both, account was taken not only of world trends in wood resources and requirements, but also of the many uses of forests other than wood production. 20. Foresters, who have been concerned with planning for a century and more, seem now to be lagging far behind the wood-using industries, particularly pulp manufacture, in both management and practice. They have at their disposal not only developments of machines, new products and techniques, but also new analytical methods and managerial theories and techniques, so that they can readily analyze rather complicated activities and increase the efficiency with which enterprises are directed and controlled. All countries should use to the full these latest aids to planning management and practice. FIGURE 2. - Don Francisco Ortuño Medina, President of the Congress, addresses the final plenary session. Left to right at the dais are: N. A. Osara, Director, Forestry and Forest Products Division, FAO Co-President J. Alves, Director-General of Forests, Portugal; Honorary President E. Saari (President of the Third World Forestry Congress, Finland); Honorary President R.E. McArdle (President of the Fifth World Forestry Congress, United States); Go-President L. Velay, Director of Forests France; Go-President A. Berrada Director of Waters Forests and Soil Conservation, Morocco; Associate Secretary-General L. Gimenez- Quintana, FAO. 21. Among the traditional management concepts discussed was that of sustained yield. While it was considered that this concept remains essential in preparing model production plans, such plans must be sufficiently flexible so that they can be varied upward or downward in accordance with changing techniques and demand for wood. Above all, cost/benefit analyses or other methods of evaluating benefits must be the base of sound forest management. 22. Forest management planning is closely dependent on economic and social conditions, and provisions must be made for flexibility to allow for changing circumstances - for instance when a country moves from a subsistence economy to a marked or industrial economy lending to changes in wood requirements, or when changes occur in the costs of production. An important factor in developed countries is that manpower is becoming in short supply and the management plan must therefore provide for increasing human productivity. This same factor will, in the future, affect developing countries. 23. The (Congress also recognized the increasing importance of nontimber values and the need, in order to avoid conflict, to draw up multiple-use inventories and to use these in making forestry plans. Another purpose of the multiple-use inventory is to make available to local managers comprehensive information on what can be done with all the resources under their management. Finally, it is essential not only to assess the nontimber needs, but also to evaluate the role of the forest in terms of benefit to the community. 24. Turning to logging and transport, the Congress stressed that large-scale operations, vocational training and mechanization were essential steps for decreasing the cost per cubic meter delivered to the factories and overcoming the manpower shortage in many countries. This trend will inevitably involve the grouping of forest owners and greater integration between logging operations and forest and forest industry planning. In fact, forest management planning would probably have to cover logging operations; silvicultural practices would have to be modified; and the effect on recreation and the landscape would have to be borne in mind. 25. Discussion next turned to selling techniques, which constitute a link between forestry and forest industries. If appropriately worked out,: selling methods could help in the problem of guaranteeing a continuing supply of wood from forest to industry. End uses of wood were: also considered, particularly the question first raised: in an earlier meeting, whether in fact sawnwood would disappear altogether as an end use or whether sawmilling should be stimulated. Some countries, where there is a need to employ the maximum amount of labor and where skills are lacking, may find it expedient initially to introduce simple labor-intensive factories as a first step toward the introduction of highly automated industries. 26. For the immediate future, the process of forest development in many countries has to be planned in stages similar to those of general economic development. At the beginning sawmills can be established. As more experience and capital become available, the forestry enterprise can move through successive stages into more finished sawnwood and sawnwood products: veneer, plywood, insulation board, particle board, and finally pulp and paper. The role of forest industries in economic and social growth was stressed. Many phases of the forest industries have relatively low capital requirements high labor inputs and rural location. Thus such industries can provide a useful intermediate stage between subsistence agriculture and full industrialization. 27. The existence of "frozen capital" in many forests was accepted. The Congress urged that 'countries review their frozen capital and make plans for it to be converted into more liquid form and- reinvested in the economic growth of the region. 28. The Congress recognized that the shift from the mechanical processing of wood to chemical processing involved a major change in the economic characteristics of the forest enterprise. This trend involves a shift from a labor-intensive industry with low capital requirements appropriate to the early stage of economic growth to a capital-intensive, low labor. requirement industry' appropriate to the more advanced stages of industrialization. Pulp and paper manufacture is marked not only by important internal economies of scale but also by significant external economies of scale by linkage with other industries in the form of technological skills, reserve of skilled labor and various service industries. 30. National forestry development plans have an important role in achieving co-ordination between forest research and forest industry. Within a country, regional planning was suggested as a sound intermediate means of ' ensuring that national objectives are properly translated in local forest management plans. For planning purposes, a "region" may be a river basin or a watershed, but in many instances better results will be achieved by using recognized administrative divisions which will make implementation more easy. For big countries, forest typology was recognized as a useful tool for regional planning. This relatively new activity of national and regional planning needs specialists, and all countries should arrange for the training of qualified personnel. 31. The final prerequisite for the acceptance and implementation of a forestry plan is that it be intelligible and convincing to the legislature, Ministry of. Finance or financing institutions, and acceptable to ordinary people. Public relations is an essential part of planning. (d) recognizing the importance of afforestation programs all over the world and the difficulties encountered in implementation, recommended (i) to governments and international agencies responsible for assistance to developing countries that full weight be given; to any request for aid in afforestation, either as a donation or as' a' loan, at a rate of interest and for a duration compatible with the financial situation of the requesting country, and (ii) that FAO strengthen and expand its seed-collecting program in order to be in a position to assist countries starting extensive afforestation schemes. 33. Under this heading the Congress deals 'first with forestry research and education; then with the problems facing public administrations, in both centrally-planned and free market economies, and with the importance of enlisting public support for forestry development; and lastly with problems of private forestry and the role of professional forestry associations. 34. The Congress recognized that research is becoming a matter of increasing political concern, owing to the -magnitude of the national resources required to pursue it and to the: contribution it can make to economic growth. Tribute was paid to the complementary work of the International Union of Forest Research Organizations (IUFRO) and FAO in promoting international co-operation in the field of forestry research, but it was recognized that the considerable financial resources and the number of highly trained personnel i required for research work point to, the need for increased efforts to disseminate existing knowledge and research techniques. 35. By and large, research work is still aimed at solving the problems of the industrialized countries. In their own interests, these countries should relate their ' research programs more closely to the special problems of forestry development in the developing world, possibly by tying part of their research funds to this purpose. The developing countries, in turn, should gear their forestry research programs carefully to the objectives of their national development plans and encourage their forestry education centers to engage in research work. While the developing countries should pay special attention to adapting to their own particular needs the scientific knowledge and technology already available, it was pointed out that they must also develop their' own basic research. Co-ordinated action between groups of countries or even concentration of efforts in a centrally-based institute may be required. 36. The Congress considered that the key issue for the advancement of forestry in the developing countries is education. 'It welcomed and supported the orientations given by the FAO Advisory Committee on Forestry Education. The basic unit in a system of forestry education is the professional college, with strong ties with a university. In many countries short-term needs require emphasis on the development of schools for forest rangers and forest products technicians. 37. The Congress regarded the creation of a favorable current of public opinion concerning forestry problems to be necessary in the national interest. The educational system for forestry must therefore also include a sustained educational effort directed at everyone, from schoolchildren to the general public, the forest worker, the forest user and the political leader. To be truly viable and self-perpetuating, the forestry education system requires another element: the postgraduate university, with its accompanying research program. 38. No forester can be fully acquainted with all the branches of knowledge involved in forestry. Specialization is indispensable, even at the ranger level. Specialists may be trained in other types of colleges or schools, but forestry faculties should aim primarily at forming those capable of synthesizing the various scientific fields involved in forestry, and of making decisions. This is one of the main reasons why a forestry faculty should have. at its disposal the full resources of a major university. A major function of the university is to give the professional forester the ability to cope with his complex responsibilities. In the developing countries, however, such responsibilities often weigh heavily on the forester already in the very early stages of his career, and there is a need for postgraduate courses to facilitate the formation of decision-making' capacities. 39. The knowledge possessed by a forester on completion of his training cannot suffice for the whole of his career. This problem, already tackled by some countries, requires wider attention. It could be solved, for example, by providing special courses to bring a forester's knowledge up-to-date and giving him the opportunity to attend them. 40. The Congress expressed appreciation of the efforts made through multilateral and bilateral aid programs to promote forestry education in the developing countries. Co-ordination between these programs should be improved and more use made of the arrangements whereby a well-established forestry faculty assists in the strengthening of a newly created faculty, to their mutual benefit. 41. The great speed with which social, economic and technical conditions are changing cannot fail to influence the formulation of national forest policies. The accelerated consumption of all resources that goes with population growth and economic development brings about a shift of emphasis from restrictive conservation to the planning and management of the renewable resources under the control of a forest administration; The forestry sector is playing an increasingly important role in economic development and new relationships have developed between forestry, industry and agriculture that must be taken into account in forest policies. 42. The time has come to make a synthesis of all these changes and of their influence on the formulation of forest policies. The Principles of Forest Policy that stemmed from the Third World Forestry Congress and that were later adopted by the FAO Conference are still valid, but there is a need for updating them, taking into account the differences between the various world regions and the requirements of both developed and developing countries. 43. The Congress considered that national forest administrations have, in general, played the leading role in the advancement of forestry and that their responsibilities are steadily growing as a result of population growth, socioeconomic development and the progress made in science' and technology. They will only be able to manage their increased tasks if they have the necessary human and financial resources and a sufficiently high status within the whole national administrative structure. 44. The two main pillars on which public forestry administration rests are the law and collaboration with other branches of the government and with civic activities. It is through adjustments in the law and through effective collaboration that public forest administrations can maximize the contribution of the forestry sector to economic development needs, and adapt themselves quickly to the new conditions created by the expansion of urban civilization. In particular, they must participate actively in the preparation of national development plans and co-operate in forestry research and education. 45. The main point of general interest stemming from the comparison of public forest administrations in centrally-planned and free market economies is the importance of integration between forest industries and their forest base, which can be easily achieved within the former type of economy owing to the very nature of the economic system. In free market economies, it can be successfully achieved when forest industries own their own forests. In other cases, comparable results can be obtained through institutional arrangements, such as collective marketing agreements among forest owners and, especially in the developing countries, long-term contracts and forest concessions that provide adequate guarantees and incentives for modern forest industries, while safeguarding national interests. 46. Changing social and economic circumstances make it increasingly clear how far the implementation of forest policies depends on the support-of an enlightened public opinion; yet, paradoxically, it appears that, as forest policy takes on new dimensions, it is ceasing to receive the support of public opinion, as if in affecting broader cross sections of the population it were losing its force of impact and penetration. This underlines the need for improved public information on forestry as the popularization of knowledge is a basic factor in reconciling the exigencies of a forest policy and the attitude of public opinion. Most successful public opinion campaigns in the past have been directed at ensuring resource protection. Such campaigns must continue, even in the developed countries, but they can be more effective if they show the contribution that the mobilization of forest resources can make to economic development and welfare. The Congress considered that foresters should pay more attention to public relations and it hoped that a project now being jointly sponsored by the Swedish Government and FAO, which makes a start at putting the tools of modern public relations activities at the disposal of developing countries, will be only the first of a series of similar initiatives. FIGURE 3. - Award ceremonies for the International Festival of Forestry Films, at the reception offered by the Mayor of Madrid in the beautiful Retiro gardens on the last night of the Congress. 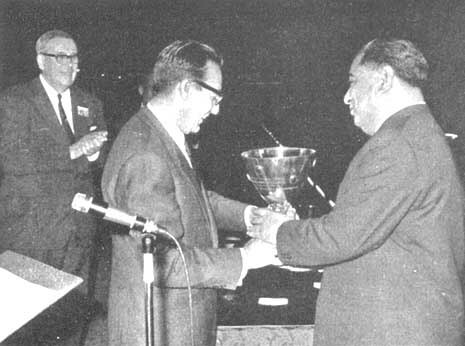 Don Francisco Ortuño Medina presents a cup given by the National Syndicate for Timber and Cork to Shri Hari Singh, Inspector-General of Forests India, for the educational documentary film "Call of the Khedda." 47. Private forestry plays a primary role in the forest economy of numerous countries, many of which are among those which traditionally account for most in the world forest and forest products economy. The problems peculiar to private forests differ widely according to the type of ownership. While large-scale forestry as an integral part of wood-processing industries comes close to the requirements of a market economy, farm forestry and related forms of ownership face a number of serious problems, such as the farmer's lack of forestry knowledge, and the inadequate size of holdings. The Congress regarded the main problem to be lack of long-term planning and the fact that forestry occupies a secondary position in the farmer's decisions. The traditional functions of farm forests are, generally speaking, becoming secondary, and commercial production of timber is now their primary function. At the same time, farm forestry increases the productivity of the farming unit in which it is included by making possible fuller use of its manpower and equipment. 48. The Congress recognized that private forests need growing investments which: will only be forthcoming if there is a guarantee of continuity, particularly in terms of stable ownership, insurance and remunerative wood prices. This requires adequate measures within the fields of both forest policy and general economic policy. Farm forestry, in particular, needs further support through structural improvements, technical assistance and the encouragement of co-operatives and associations. The discussion based on the example of the work carried out by the Norwegian Forest Owners' Association made clear the interest of forest management plans for farm forests and of combining the respective plans for forestry and for agriculture in the farm units, but it is essential for (he success of such plans that the farmer is sufficiently confident in his capacity to implement them. This can be attained if the farmer himself participates in the preparation of the plan and if this plan comprises the total economic enterprise of the farmer. 49. The Congress discussed the role that the various: forestry groupings and associations play or could play in the implementation of national forest policies. It is through such associations that government authorities can explain the objectives of these policies to those concerned, and it is to such associations that governments entrust wide responsibilities for the implementation of such policies. However, any association is, in fact, a pressure group that will tend to orientate in a given direction the national forest policy. In the complex world of today, such pressure groups, if they represent homogeneous or at least well-balanced interests, constitute a useful element of information for those responsible for economic and social policies. 50. Most important among the forestry associations are the professional forestry associations, grouping the technicians of forestry and forest industries on whom depend the correct implementation of forest policies and the planning and organization of industries. The professional forestry associations also fulfill the rule of homogeneity, and the experience of the countries where such associations already exist indicates that it would be to the advantage of all countries to form such associations, even though the number of professional foresters may be low. The Congress considered that the condition of homogeneity referred to earlier might favor an undesirable proliferation of forestry associations. For this reason it might be useful to form at the national level a federation of such associations which, in turn, could eventually group itself with other national federations into a union at international level. (d) that the Director-General of FAO should undertake the preparation of a revised version of the FAO study Forest policy, legislation and administration, in which account would be taken of the new problems and conditions facing forest administrations as a result of the present rapid changes in world economic and social conditions. 52. The Congress also recorded that the Commonwealth Agricultural Bureaux, through publication of Forestry abstracts over the past 27 years, had greatly benefited forestry by providing a unique service in the worldwide dissemination of forestry knowledge. The Congress commended the Commonwealth Bureaux, and expressed the hope that the Commonwealth Forestry Bureau would enlarge its activities sufficiently to maintain coverage of the expanding volume of forestry literature. The Congress also expressed its appreciation of the work done by other international and national agencies contributing to the dissemination of forestry knowledge. (d) to propose policies to increase the availability of funds for forestry and to propose new approaches intended to lessen the effects of fund scarcity through international co-operation, trade development agreements and similar actions. 54. The Congress took note of the FAO estimates which indicated that for the period 1961-75 close to U.S. $39,000 million would have to be invested in new wood products processing capacity, about $3,300 million in logging requirements and $4,900 million for forest management activities. Of the additional processing capacity, pulp and paper manufacture would account for 86 percent, wood-based panels 8 percent and sawmilling 6 percent. In pulp and paper the developing countries would have about 16 percent of this expansion, but due to higher costs this would take up about 25 percent of the total investments expected in the industry. 55. In logging, the developed countries would account for about 68 percent of the new investment. The estimates of additional investments in management could also be expected to occur largely in the forests of the developed countries. 56. Despite the fact that many governments recognize the importance of early and substantial investments in forestry and forest industries, the Congress recognized that, from a global point of view, the amount of investment currently being made in such projects is inadequate. The developing countries have obtained a small share of the worldwide postwar expansion of forest industries in spite of their large forest resources and growing world markets. 57. Speakers pointed out that a worldwide production policy, mobilizing all existing resources, would be beneficial in attempting to expand forest industry to meet the expected demand for forest products. It was considered necessary in formulating programs for forestry investment that regions and resources which do not presently enjoy the most favorable technical and economic conditions be included in such programs. 58. Discussing the causes of inadequate investments in developing countries, members of the Congress expressed the view that these were largely due to insufficient availability of basic data, lack of qualified economists and development planners, as well as the frequent lack of co-ordination between different government agencies in dealing with forestry and forest industrial development programs. Instability of political environment in many of the developing countries also added to the difficulties in obtaining adequate financing, particularly from abroad. It was also pointed out that in the developing countries the costs entailed in importing equipment and in the installation of services were frequently excessive, to the extent that they did not justify the financing of a project. Lack of industrial and transport infrastructure also has a deterrent effect on forestry and forest industrial development projects. 59. The Congress recognized that the principal characteristics of forestry investment, namely the long time lag between the initial investment and yield, and the fact that investments in forest industries are generally capital intensive, make it difficult to find readily the necessary financing from sources currently available for investment. As access to normal bank credits is rather unlikely in the case of long-term capital requirements, the establishment of a special credit institution, modeled on the lines of the agricultural development credit institutions operating at present in many countries, was considered as one way of providing the necessary long-term credit. Many of the developing countries possess climatic and soil conditions which favor short tree rotations, which in itself helps to eliminate one of the major banking problems relating to forestry investment. 60. A number of factors determine the attractiveness and justification for forest investment. Authors of papers listed adequacy and accessibility of raw material, availability of markets, a favorable forest growth rate, a satisfactory ownership pattern, adequate forest legislation coupled with a forward-looking forest policy, a reasonable amount of government control, political stability and confidence in the managerial ability, as prerequisites to attract needed capital for forestry investment. 61. The Congress recognized that in certain cases governments are also faced with the problem of obtaining funds for forestry efforts not specifically for timber production and where the results may not be immediately expressible in economic terms. 62. The Congress underlined the many advantages to the developing countries of increased investment in forestry and forest industries. In many of these countries forests form a renewable resource which can provide raw materials in large quantities for continuing industrial activity. Coupled with this is the favoring trend of an increasing world market, the possibility of import savings and greater foreign exchange earnings to the country and the better utilization of an under- or unemployed labor force. 63. The Congress summarized the sources of financing for forestry investment under the categories of government institutions, private domestic and foreign capital, bilateral loans and funds from international financing agencies. (e) investment in forest plantations for protective purposes. 65. The Congress emphasized the importance of domestic capital forming a part of the total investment required for the financing of a forestry project. It drew the attention of institutions satisfied with long-term, low-yield investments to the opportunities offered for investment in forestry projects. 66. In all cases where investment is proposed it is of overriding importance that a good prospectus be prepared and made available to possible investors. 67. The Congress stressed that forestry investment in the developing countries may be hindered by lack of the basic data and qualified personnel. It is essential, therefore, that in the preparation of a forestry investment program the need for training personnel and the execution of forest resource surveys are not overlooked. 68. The Congress discussed the problem of an acceptable rate of return on forestry investments. It was clear that no precise figure may be stated although for prospective investors general rules of thumb are often used. It was stated that lower rates of return than are required for other industries are often acceptable in forestry. But it was recognized that higher rates of return are necessary to attract capital for forestry investment in the developing regions where higher risk conditions at present prevail. The suggestion was made that, in estimating rates of return on forestry investments, it would be well to consider wood production aspects separately from more intangible returns such as improvement of the social infrastructure and welfare values. It might be possible to break down a total investment cost into the two categories and calculate the rate of return on the wood production portion separately. 69. The Congress discussed means of encouraging additional investment in forestry in developing countries. It recommended that forest authorities familiarize themselves with methods of preparing investment proposals. It was pointed out that the establishment of a forest development planning agency would result in more recognition of this important area of national development. At all times there should be close co-ordination between the government agencies involved in the several sectors of development planning. Furthermore, closer co-ordination should be encouraged between individual governments for regional planning and even regional projects. 70. The Congress referred to the Secretary-General of the United Nations for further study the views expressed by members that the Regional Development Banks should be encouraged to grant long-term and low-interest loans to finance forest plantations and forest industries development in developing countries. 71. Some members felt that, in the face of increasing competition for investment funds, it would be advantageous to nominate a special Development Bank to act as an intermediary and channel through which developing countries could secure foreign financing for forestry. It was emphasized that the attractiveness of investment in forestry would be enhanced if a clear and reasonable forest policy existed in a country. Furthermore, forest investment would be encouraged by an enlightened attitude which reduced royalties, taxes and import duties in a country in the early stages of forestry development. 72. It was also considered that governments might encourage investments from social security funds and other similar institutions in afforestation projects, and should introduce measures to guarantee the results of investment by the aforesaid organizations, given their social purposes. 73. Views were also expressed that, especially in developing countries, governments should make provision in forest legislation for tax-free contributions and adequate inducements to be made for savings to be amassed for use in financing programs of forestry restocking and industrialization. 74. The Congress noted with interest the successful cooperative organizations of forest owners in some developed countries as a means of financing and developing both forestry and forest industry activities. It felt that this approach warranted study for possible use, modified to local conditions, in some of the developing countries. 75. In this connection the Congress drew to the attention of countries where similar economic conditions prevail, the system of forest industrial complexes operated in Mexico. 76. Co-operative activities among forest owners in any country of the world constitute one potentially very important way of helping to solve the great problem of financing private forestry. Co-operation in all its forms always represents a powerful economic element, and it would be unfortunate if this possibility were not also used to its widest extent in forestry. The implications would not only be economic in the sense of money returns, but would also considerably improve the standard of management, harvesting and marketing techniques. 77. In its efforts to further forestry in the world, FAO itself should give wider consideration to the possibilities offered by voluntary co-operation between forest owners in forest management, marketing and forest industries, and should actively promote and stimulate all kinds of groupings of forestry producers according to the conditions prevailing in individual countries. 1. Regional centers for the preservation of genetic stocks should be developed under FAO co-ordination and within the framework of the germ plasm conservation program being envisaged by FAO. 2. The efforts of the Governments of Australia and Mexico to make available seed of eucalypts and pines for provenance research were acknowledged with great appreciation and the hope was expressed that FAO would be given additional means to continue assistance in this field on an increasing scale. 3. Economic aspects of tree breeding deserve a thorough examination at a second joint FAO/IUFRO World Consultation on Forest Tree Breeding, possibly to be held toward the end of the decade in the United States of America. 5. Before embarking on large-scale afforestation programs, governments should ascertain that all the necessary preliminaries (definition of the objects of management, market studies, species and provenance trials assessment of site potential, investigations into the possibilities for forest transport and mill-site factors) have been complied with. A manual by an international organization, such as FAO, would fill an existing gap and would be helpful both for developing and for some developed countries. 6. Especially useful for developing countries would be a set of sufficiently reliable but easily identifiable site factors, the evaluation of which before planting would be simple enough to be accomplished also by nonspecialists. IUFRO was invited to give thought to this matter and the hope was expressed that FAO would soon initiate action in the field of forest soils. 7. There is need for a worldwide body, set up ex novo by an international organization such as FAO, or resulting from the transformation of existing bodies with similar terms of reference but covering a more limited geographic area, to study thoroughly problems related to the afforestation of difficult sites, due attention being paid to the economic aspects. A series of ad hoc meetings dealing in succession with the different sites (dry areas, wetland, steep slopes, areas above the tree line, saline and alkali soils, rain forests, freshwater swamps, sand dunes, etc.) could attain the same objectives in perhaps a more flexible way. 8. The Commission drew the attention of the Director-General of FAO to the interest of FAO's pursuing further its studies on the utilization of desert and semidesert lands and the possibilities of halting the advance of desert conditions, especially in the lands south of the Sahara where this problem appears particularly urgent. 9. The Commission recommended that FAO provide leadership in forest pathology and entomology, to assist in programs such as disease and insect impact surveys and research, and to stimulate international co-operation in planning and co-ordinating research. Greater FAO and IUFRO participation in forest disease and insect extension activities should be promoted, including the preparation, translation and distribution of instructions on how to apply disease and insect control practices at the local level. 10. Great harm is inflicted on the forests in many countries by forest fires. It would therefore be advisable for FAO to organize a special committee to elaborate the most effective methods and equipment for forest fire control and facilitate exchange of experience in this field. 11. The Commission commended the reorganization of the financing and procedures for the Forest Terminology Project, and expressed satisfaction that the basic English language part of it would be completed by 1970. It urged FAO and other international and national organizations to assist in the publication and wide distribution of terminologies in both developed and developing countries. 12. The Commission recommended that FAO and IUFRO collaborate in facilitating an exchange of information on the use of computers in the field of forestry research and management. To that end, the following were proposed: the establishment of an international committee of specialists entrusted with studying the problems involved in the supply of computers to the forest services of developing countries; arrangements for programs of training in the use of computers; and the organization of an international seminar on the use of computers in silviculture and in forest management, such seminar to be attended by directors of forest services and research bodies. 13. FAO should incorporate into its program of work, under the aegis of the respective FAO Regional Forestry Commissions, a systematic analysis of today's and future silvicultural systems. This task should be carried out by experienced silviculturists who might be engaged by FAO on a consultant basis. 14. Because in developing countries the professional training of forest workers is still in an embryonic stage and on the whole forestry work is arduous and sometimes dangerous, the Commission urged that the international organizations concerned should intensify their activities to improve the social security and productivity of the forest worker. 15. (a) The Commission urged that the newly established FAO Committee on Forest Development in the Tropics should continue FAO's earlier studies of the problem of shifting cultivation and its control. (b) The Commission proposed that FAO institute a working party of representatives from the disciplines of anthropology, sociology, economics, forestry, agriculture, pedology, ecology and political science, and charged with reviewing the problem of shifting cultivation so as to develop a program of study and research which will lead to a fundamental understanding of the problem and its control. 16. In respect of international trade, the Commission recommended that international agencies, e.g., FAO and UNCTAD (United Nations Conference on Trade and Development), undertake research in market and trade development in forest products with a view to opening up new or expanding current markets. 17. The Commission requested the Director-General of FAO to include in his program of work for 1968-69 plans for a World Tropical Forestry Congress. The new FAO Committee on Forest Development in the Tropics may be asked to organize such a congress. 18. The Commission stressed the importance of the utilization of lesser known species, especially in connection with the urgent problem of improving the housing situation in many areas of the world. There was need to disseminate the results of research as rapidly and completely as possible. It noted with satisfaction that FAO was engaged in collecting and exchanging information about species in some regions, e.g., Latin America, and recommended FAO to take steps to extend these activities to other parts of the world. 19. In order closely to associate forestry and forest industry development, small-scale demonstration plants could be useful in developing countries where surveys have shown possibilities for economic exploitation. Such plants could also be of great value in developing methods of using lesser known species. The Commission urged FAO to pay attention to possibilities of creating such demonstration or pilot plants. 20. The industrial utilization of bark was one field where further research was needed. FAO and IUFRO were urged to study possible methods to induce further research and investigations in this field and to disseminate available information both of scientific results such as on the chemical composition and modification of bark and on technical solutions of its use developed in different countries. 21. In the context of water needs by forest industries and water pollution problems, the Commission emphasized the importance of progressive development and codifications of international law concerning the use of international drainage areas and urged the competent bodies of the United Nations to encourage such development. 22. The Commission expressed the view that FAO should examine the possibilities of establishing a wildlife training school or college, on the lines of the existing school in Tanzania, in a suitable country in Asia, which should be chosen after consultation with the interested countries. 23. National and international organizations were recommended to give increasing emphasis to ecological concepts in developing and improving methodology for management to maintain adequate vegetative cover, where the principal form of land use is watershed protection or national park management, and in areas specially set aside for wildlife management or for recreation. It further recommended that FAO strengthen its activities in these fields. 24. The Commission, recognizing the important contribution that scientific studies on forest influences may make to developing countries, and recognizing that most of such studies now undertaken are confined to the United States, Europe, and the U.S.S.R., recommended that FAO take the lead in extending such activities to other regions of the world, and in compiling and evaluating the results obtained. For this purpose FAO might reactivate and mobilize the Working Parties on Watershed Management that exist in the various regions of the world, and specifically include forest influences in their terms of reference and in their work programs. IUFRO, in collaboration with FAO, should encourage the development of a methodology which would permit easy comparison of results between countries. FAO should also study the possibility of establishing more research stations on forest influences under different conditions, which could also offer specialized training in the various fields involved. 25. The Commission recommended that FAO and research institutes in member countries should closely collaborate with Unesco during the International Hydrological Decade which that Organization has launched. 26. The Commission recommended that the conservation and the utilization of forest resources and putting to use the protective influences of the forest for the welfare of local populations be recognized in member countries as appropriate lines of activity to warrant support under the Freedom from Hunger Campaign. 27. The Commission considered that there was insufficient knowledge of methods and principles for land and particularly forest land classification. It recognized the basic importance of comprehensive land and land-use statistics, particularly in regions subject to shifting cultivation, land deterioration and flood. Because such statistics are essential in planning and determining land-use policies, particularly for such marginal lands as may be subject to reclamation and afforestation, the Commission recommended that research institutions, preferably under the auspices of IUFRO and in collaboration with FAO, investigate the methods for land, and particularly forest land, site classification aiming at finding internationally applicable methods. ¹This general paper may be obtained from the Distribution and Sales Section, FAO, Rome, Italy. All other documents are only obtainable from Sr. M. Prats Zapirain, Secretario General, Dirección General do Montes, Ministerio de Agricultura, Madrid, Spain. 2/26 The planning, organization and implementation of a large-scale afforestation and reforestation in the Philippines. 3/8 Toward an orderly resolution of the responsibility of the Federal Government for outdoor recreation in the U.S.A.
3/27 Forestry educational practices in the U.S.S.R.
3/32 Educación e investigación forestal - ¿Dónde comenzar? ² Not submitted to consideration of the Congress. 4/1 Are public promotional measures for forestry justified and necessary? I/5 Cross- and self-incompatibility and natural selfing in yellow poplar, Liriodendron tulipifera L.
I/23 Estudios sobre la impermeabilidad de la semilla de Gleditschia triacanthos L.
I/71 Mechanization of reforestation operations in plain forests of the U.S.S.R.
I/72 Mechanized afforestation of mountain slopes in the U.S.S.R.
I/74 Forest regeneration in the U.S.S.R.
III/1 Why are forest trees planted in and zones? III/12. Est-il avantageux dans la sylviculture de labourer toujours le sol? IV/14 Timber harvesting in the U.S.S.R.
VIII-1/3 The social and economic implications of recreation demand for national forest policies. VIII/10 Principles of management in forests of green zones around populated areas of the U.S.S.R.
IX/2 Is there a dualism between the beneficial and recreational influence of the forests on the one side and its economic functions on the other side? It is regretted that the cover photograph chosen for Unasylva, Volume 20 (1-2), Numbers 80-81, was given the caption of another photograph which should have appeared in the same issue. The error was corrected in a later impression. The two photographs involved, with their correct captions, appear here. 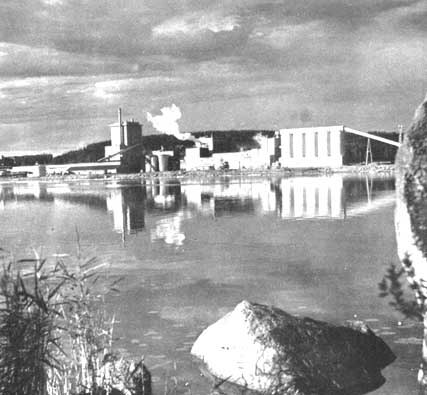 The integrated mills at Aänekoski, central Finland, of Metsäliiton Selluloosa Oy. The include a sulfate pulp mill of 100,000 tons per year capacity, a sulfite pulp mill of 60,000 tons, a paper mill of 22,000 tons a board mill of 3,000 tons, a groundwood mill of 20,000 tons capacity and a chemical plant producing 6,000 tons of various derivative products. A sawmill producing 10,000 standards is also included in the complex, and in 1966 a new board mill with an annual output of 50,000 tons will be started. This company is a co-operative undertaking of Finnish forest owners (farmers), about 3,5,000 of them being shareholders. There are many other wood-processing industries owned by this co-operative group. 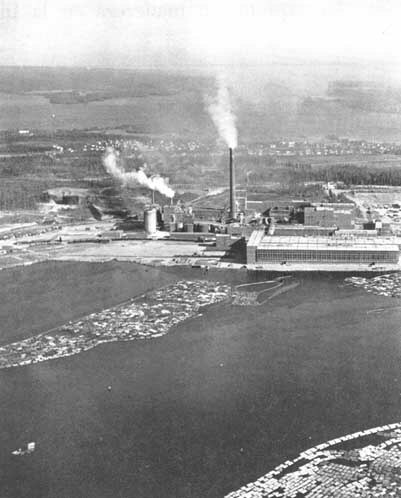 The integrated pulp, paper and linerboard mills of Enso-Gutzeit Oy at Kaukopää, eastern Finland. The Kaukopää Mills (not all shown in the photograph) have an aggregate annual capacity of 650,000 tons of sulfate pulp, 90,000 tons of semichemical pulp, 450,000 tons of linerboard, 100,000 tons of paper, 30,000 standards of sawn lumber, 60,060 tons of various chemical products, and 800 million kWh of electric energy. The wood is transported to the mills mainly through floating in bundles over the extensive system of lakes and rivers. The Finnish Government is the major shareholder in Enso-Gutzeit Oy, but there are also considerable private interests in the company.